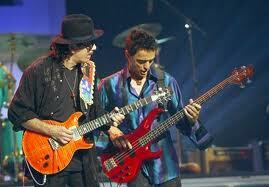 Carlos Santana with his base guitarist Benny Rietveld. "The highest compliment for me is if someone comes to one of my shows then they go home and get rid of a lot of stuff in their closet, because my music has changed them so much these clothes don't suit them any more!" Having heard the band play live in New Plymouth in 2003, I'm afraid I must report that, much as I loved the show, I did not as a result change my personal style. After it, the (slightly deafened) X and I hung about at the barrier beside the stage, along with a melee of other hopefuls waving backstage passes. After a long time we were admitted to a cramped basement room where a lavish supper was laid out. No one was there to eat, though. There were reporters and photographers, a number over-excited contestants who had, by what means god knows, won the opportunity of shaking Carlos' hand, and various uncategorisable, eccentrically dressed others. What they had in common was their comparative youth. We were at least 20 years older than them all, and from time to time, as we milled and fidgeted in expectation of an imminent celebrity appearance, they cast us glances that ran the gamut from pitying to accusatory, and always carrying the unspoken question, "What on earth are these old people doing here?" After a very long time, a side door opened and cry went up of, "Benny! Benny!" Benny Rietveld smiled politely. Then, cutting through swathes of admirers, made a beeline for us. We hugged. Over his shoulder, I saw mouths fall open - these oldies were actually friends of his! Conversation was impossible - fans are like bulldozers on steroids - and Benny too sweet-natured to repel them. He asked us to go back to the hotel and hang out with him and the band, and he'd show us pics of D and R's new baby. I cast a hopeful look at the X. His face told me all I needed to know. It was already way past his bedtime and if it were postponed any longer, he would suffer in ways I couldn't begin to understand. I regretfully declined and we left. But just allow me to empahsise the point - I was invited to hang out with Santana. OK?